Glenway Wescott was born today, April 11, in 1901. He was a poet, novelist and essayist. A figure of the American expatriate literary community in Paris during the 1920s, Wescott was out as gay. His relationship with longtime companion Monroe Wheeler lasted from 1919 until Wescott's death. Wescott was born on a farm in Kewaskum, Wisconsin in 1901. He studied at the University of Chicago, where he was a member of a literary circle including Elizabeth Madox Roberts, Yvor Winters, and Janet Lewis. Independently wealthy, he began his writing career as a poet, but is best known for his short stories and novels, notably The Grandmothers (1927), which received the Harper Novel prize, and The Pilgrim Hawk (1940). 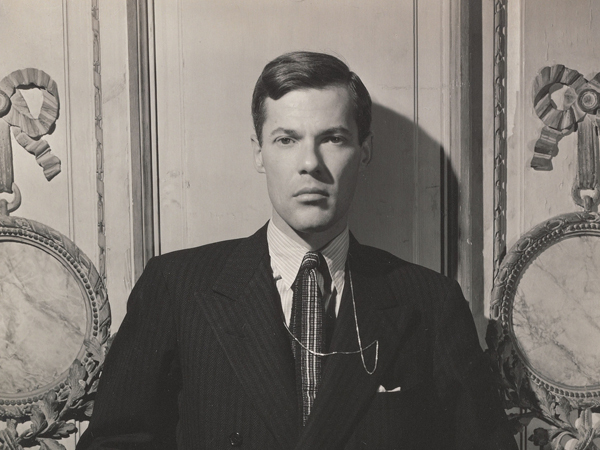 Wescott was the model for the character Robert Prentiss in Hemingway's The Sun Also Rises. After meeting Prentiss, Hemingway's narrator, Jake Barnes, confesses, "I just thought perhaps I was going to throw up." Wescott lived in Germany (1921–22), and in France (1925–33), where he mixed with Gertrude Stein and other members of the American expatriate community. In the Autobiography of Alice B. Toklas (1933), Gertrude Stein wrote about him, "There was also Glenway Wescott but Glenway Wescott at no time interested Gertrude Stein. He has a certain syrup but it does not pour." 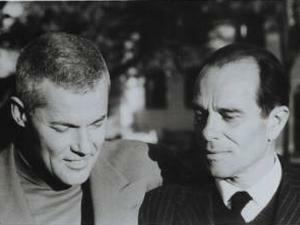 Wescott and Wheeler (pictured at right) returned to the United States and maintained an apartment in Manhattan with photographer George Platt Lynes. When his brother Lloyd moved to a dairy farm in Union Township near Clinton in Hunterdon County, New Jersey in 1936, Wescott along with Wheeler and Lynes took over one of the farmhand houses and called it Stone-Blossom. His novel, The Pilgrim Hawk: A Love Story (1940), was praised by the critics. Apartment in Athens (1945), the story of a Greek couple in Nazi-occupied Athens who must share their living quarters with a German officer, was a popular success. From then on he ceased to write fiction, although he published essays and edited the works of others. In her essay on The Pilgrim Hawk Ingrid Norton writes, "After...Apartment in Athens, Wescott lived until 1987 without writing another novel: journals (published posthumously as Continual Lessons) and the occasional article, yes, but no more fiction. The Midwest-born author seems to slide into the golden handcuffs of expatriate decadence: supported by the heiress his brother married, surrounded by literate friends, given to social drinking and letter-writing." On February 22, 1987, Wescott died of a stroke at his home in Rosemont and was buried in the small farmer's graveyard hidden behind a rock wall and trees at Haymeadows. Later Monroe Wheeler was buried alongside him.